Square preserving jar - 130g ( 5 oz ) with golden crew top cap. 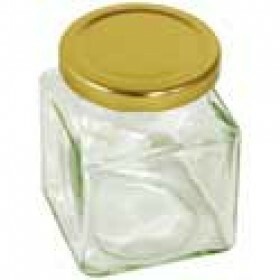 ..
Square preserving jar - 340g ( 12 oz ) complete with gold screw top lid. ..
Square preserving jar - 200g ( 7 oz ) with golden screw top lid. ..